What is Butcher Netanyahu doing in Africa? Butcher Netanyahu is on a four-nation tour of sub-Saharan Africa for the first visit of Israel’s prime minister to the continent in almost 30 years. He arrived in Uganda on Monday on the first leg of a four-day trip which will also take him to Kenya, Rwanda and Ethiopia. By visiting Africa, the Israeli premier wants to end decades of hostility and convince African countries to stop voting against Israel at the United Nations. Netanyahu also seeks to cast off Israel’s pariah status in the black continent as he faces growing criticism from Western allies over the dim prospects for a resolution to the decades-old Israeli-Palestinian conflict. In the United Nations, Israel is a constant subject of rebuke over its settlement enterprise in the occupied West Bank and other violations, including its crippling blockade of the Gaza Strip. One of Netanyahu’s objectives is to convince African nations not to vote against Israel. “In the UN there are many [resolutions] which target Israel and we want to change this with the help of the Africans,” Arye Oded, a former Israeli ambassador to Kenya and Uganda, told German broadcaster DW. Israel’s relationship with African nations has historically been fraught because of support for the Palestinian cause from many countries on the continent. The uneasy history of relations is evident in the fact that no Israeli leader has visited sub-Saharan Africa since Yitzhak Shamir in 1987. Scores of African countries, including all the countries that Netanyahu is visiting, cut ties with Israel following the 1973 Israeli-Arab war only to restore them in the 1990s. Israel’s ties with black African countries were further frayed because of its historic support for the apartheid regime in South Africa. At a recent conference on Africa-Israel ties, Israeli foreign ministry official Yoram Elron noted Tel Aviv’s need for support from African nations in international forums. “Today relations with the African continent are high on our foreign policy agenda,” he told dozens of African dignitaries and diplomats. However, African nations that have survived colonialism and more recently Western plans are skeptical. Israeli exports to Africa totaled about $1 billion last year, about 2% of its total exports. 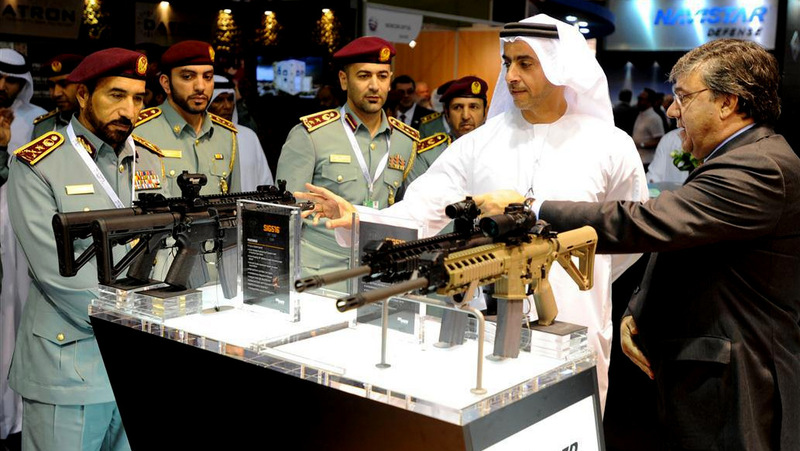 With insurgencies and Takfiri militancy growing across Africa, including Qaeda-affiliated al-Shabaab and Daesh-linked Boko Haram, Israeli leaders are looking to sell advanced military equipment to the continent, the New York Times wrote. The move comes as Israeli exports to traditional markets in the EU and US have become volatile, Ohad Cohen, head of foreign trade at Israel’s Ministry of Economy and Industry, told the Times. Filed under: Africa, BDS, Israeli Aggression, Jewish Mentality, Jewish terrorism, Jewish violence, Nazi Israel, Netanyahu, South Africa | Tagged: Israeli Affairs |	Comments Off on What is Butcher Netanyahu doing in Africa? nsnbc : Israeli Prime Minister Benjamin Netanyahu, on Monday, left Israel to visit several African countries. Netanyahu aims at finding new trade partners in Africa as Israel increasingly feels the impact of the international Boycott Divestment Sanctions (BDS) campaign. The Africa tour of Benjamin Netanyahu is the Prime Minister’s first, and the first Africa tour by an Israeli prime minister since the late PM Yitzak Rabin visited Morocco in 1999. Before his departure the office of the Prime Minister released a video in which Netanyahu described his Africa tour as a “historic visit” that was of great importance “from diplomatic, economic and security perspectives”. Addressing dignitaries in Entebbe, Uganda, Netanyahu said: “I am pleased that Israel is going back to Africa in a big way. .. We are opening Africa to Israel again”. Netanyahu’s four-day tour will take him to Uganda, Kenya, Rwanda, and Ethiopia. 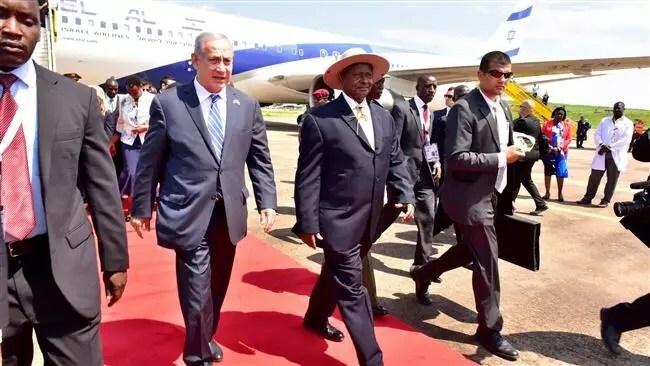 The first leg of his journey takes Netanyahu to Entebbe, Uganda, where he will meet with leaders from seven African nations including Uganda, Kenya, Rwanda, South Sudan, Ethiopia, Zambia and Tanzania. The office of the Israeli Prime Minister reported that Netanyahu is accompanied by a delegation of over 50 business people from 50 companies “to forge commercial ties with African companies and countries”. Israeli business delegates will participate in economic seminars with their African counterparts in Kenya and Ethiopia. Israel has, over the past years, increased its focus on Africa with Defense Minister Avigdor Lieberman touring the continent to meet politicians and businessmen. The increased focus on Africa and Netanyahu’s “historic” visit comes against the backdrop of an increasingly successful international Boycott Divestment Sanctions (BDS) campaign against Israel. Israel has also tried to reach out to South Africa, one of the strongest supporters of Palestine on the African continent. Until the end of the apartheid regime, South Africa was one of the strongest and closest Israeli partners in Africa. In March Dore Gold, the Director-General of Israel’s Foreign Ministry, traveled to South Africa in an attempt to mend and strengthen ties between the two countries. Among African leaders who have visited Israel in recent years were Kenya’s President Uhuru Kenyatta and Liberia’s President Ellen Johnson Sirleaf. What does it mean when the US and British financial systems launder hundreds of billions of dollars of illicit funds stolen by world leaders while their governments turn a ‘blind eye’, and yet the very same Anglo-American officials investigate, prosecute, fine and arrest officials from rival governments, rival banks and political leaders for corruption? What does it mean when the US government expands a world-wide network of nuclear missiles on bases stretching from Poland, Bulgaria, Romania, the Gulf States to Japan, surrounding Russia, Iran and China, while the very same US and NATO officials investigate and condemn rival defense officials from Russia, China and Iran, as military threats to peace and stability? What does it mean when Anglo-American economic officials devote decades to raising the age of retirement, reducing working and middle class household income, cutting workers compensation, expanding part-time work, setting the stage for mass layoffs slashing unemployment and health benefits and reducing social spending by the hundreds of billions of dollars and then turn around and investigate and threaten rival countries, like China and Argentina with loss of markets, investment and employment for not doing the same thing ? The meaning of Anglo-America’s long-term, large-scale structural regression is clearly evident across the world. From Europe to Latin America and from Asia to Africa, socio-economic and politico-military agendas have been reversed. Since the end of the Second World War there had been incremental gains in labor rights, stable employment, poverty reduction and working conditions. Recently, these have all been reversed: Longer working days and weeks with reduced salaries and benefits; unstable temporary work replaces stable employment; employer-funded pensions are eliminated and replaced by multi-billion dollar corporate tax cuts and off-shore tax evasion. Systematic structural swindles by the leading financial institutions have forced employees to delay retirement for years in order to ‘self-finance’ their own meager ‘pensions’, some expecting to ‘die at the job’. Capitalist regression has been implemented by arbitrary state dictates and authoritarian decrees, erasing any pretense of democratic procedures and constitutional laws. The regressive and retrograde leader-states from the imperial centers impose their conditions on follower regimes like Mexico and Russia forcing them to reverse their legacy of social progress while blackmailing these regimes’ oligarchs with the loss of lucrative markets, access to tax and money-laundering havens and impunity for their crimes and swindles. For the past three decades, the US and Great Britain have led the global drive to undermine labor’s advances. First, the economic structure sustaining labor organizations were dismantled and fragmented. Then organized labor was decimated, co-opted and corporatized. Capital proceeded to reverse labor and social welfare legislation and lower wages, in order to impose longer workdays and destabilize employment. The mass media re-packaged the regression cycle as ‘economic reform’, a euphemism, which disguised the re-concentration of power, wealth and income over the last three decades. The growth of inequality and the concentration of wealth and assets to the 1% became ‘the standard’ for the Anglo-American era. However, class organization and the vicissitudes of class struggles continued to constrain efforts to impose unchallenged Anglo-American capitalist rulership throughout the world. The first decisive blow against social reform resulted from the systematic Anglo-American breakdown of the former USSR and allied nations of the Warsaw Pact in East Europe. This was followed by the endogenous dissolution of Communist Party rule in China, Russia, Eastern Europe, the Baltic and Balkan states and their conversion into capitalist satellites. Social welfare, full employment, public pensions and health systems were shredded; labor lost all its rights except one – the right to emigrate to the West as cheap labor. From Russia to Latvia and Poland to Bulgaria and Romania, there were massive layoffs, plant closures and the total dissolution of social security networks driven by the Anglo-America neo-liberal onslaught. The Atlantic Alliance brought their new Eastern satellites to social submission. Until the second decade of the 21st century, Western Europe’s centers for the defense of the progressive social agenda were in France, Italy, Spain, Greece and Portugal. The social agenda in Latin America and China faced the Anglo-America offensive even earlier. France has been the center where the Anglo-American regressive attack on socio-economic policy and Southern Europe’s resistance has been playing out. By 2015 the regressive alliance had overturned all progressive social policy in the former communist bloc countries. Their alliance with Germany’s finance sector give them tight control of the EU and they successfully decimated the progressive social programs and labor legislation in Greece, Spain and Portugal. France became the centerpiece for Western capitalism’s drive to incorporate Italy into the regressive orbit. The conquest of France and Italy would completely reverse 70 years of incremental labor gains after the defeat of fascist capitalism. The assault on France’s progressive social agenda is spearheaded by the retro-Socialist President Francois Hollande and his troika of authoritarian hyper-capitalist ministers: Financial Minister Michel Sapin, Prime Minister Manuel Valls and Economy Minister Emmanuel Macron. The strategy of relying on a ‘nominal socialist’ to destroy the social welfare state is a classic ‘Trojan Horse’ operation. Hollande’s virulent anti-labor policy is implemented by decree under a joint plan developed in association with France’s leading industrialists. The imposition of the regressive policy in France began in stages. It first established the retrograde political leadership with Valls, a notorious authoritarian police-state official willing to over-ride any democratic niceties. The Economy Minister, Emanuel Macron, a millionaire investment banker, is a direct associate of the financial elite, with no qualms in slashing labor programs. The Finance Minister Michel Sapin, a long-time accomplice of the French bureaucratic-capitalist elite, is prepared to slash pensions and public services while reducing job security in order to lower the cost of labor to capital. Once the Hollande and his troika took control of the centers of political power, (and after militarizing French society in response to the terrorist attacks), the regime launched its anti-labor offensive to shred the progressive social agenda. Its first target was its most formidable – the mass of the French working class. 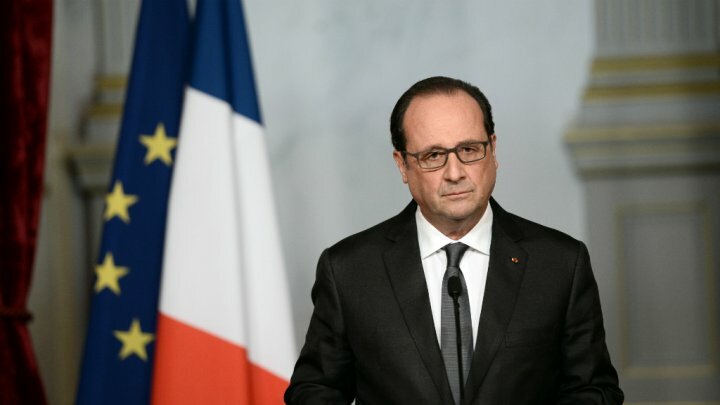 Declaring ‘anti-ISIS’ martial law powers, Hollande adopted an outright authoritarian strategy, bypassing the elected French Parliament in the legislature and imposed ‘rule by decree’ with the announcement of a highly regressive labor law against the French people. The dictatorial labor decree was a first step to weaken organized labor’s capacity to protect wages and job security in order to give a powerful impetus to employer control over the French labor force. Once Hollande’s labor decree established capitalist supremacy, his Troika would be in a decisive position to reverse seventy of incremental social advances. The joint Hollande-Troika-capitalist bloc emasculated the legislature, leaving a weak, bleating chorus of so-called ‘left Socialists’ to bemoan their political impotence. Then an entirely new business anti-labor code was rolled out, which included the right of bosses to hire and fire workers at will, extend the workday , lengthen the work week, undermine labor’s bargaining power and restrain strikes and job actions. This would open the way for a wave of irregular and contingent jobs for new workers . . . Using the pretext of terrorist attacks, the French capitalist class had begun to rule by decree to further expand and deepen their long planned assault on labor. Hollande’s troika and France’s capitalists are lowering corporate taxes and employer contribution to social payments. Regulations that restrained the concentration of elite power were eliminated. With curfews and ‘anti-terrorist’ militarized police in the streets, French business elite could now freely begin to to imitate the Anglo-American capitalist elite and impose an iron-fisted New Order. Without labor constraints on French capital, the bosses are is free to relocate factories and investments any and everywhere, under the most favorable wage, tax, employment and environmental conditions. No longer required to invest in French industry, the business elite can transfer capital from industry to financial sectors, allowing hundreds of billions of euros to be laundered in off shore tax havens. The Hollande troika will now also establish its own version of ‘Security and Exchange investigators’ to prosecute and fine its rival Anglo-American financial swindlers, just as the Anglo-Americans pursue their French competitors today. The Hollande regime’s regressive social agenda has opened the door for an even more extreme Presidential prototype to follow and Alain Juppe is waiting. The rabid Republican Party presidential candidate, Alain Juppe, promises to go ‘whole hog’ in utterly destroying the French welfare state, as it has existed since the fall of fascism. If elected president, Juppe promised to slash 100 billion euros from the budget – double the amount that the Hollande regime currently seeks to cut. Juppe has pledged to eliminate 250,000 civil service jobs in all vital social sectors; to delay the retirement age from 62 to 65; eliminate the 35-hour workweek; facilitate worker layoffs and decimate unemployment benefits. Finally, Juppe has promised French capital that he would implement their entire business agenda, cut taxes for business and bankers and eliminate the tax on inheritance implemented nearly four decades ago. In other words, the Hollande regime’s assault on labor and embrace of business has opened the door for the rise of the extreme right. Moreover, Hollande has manipulated the incidents of Islamist terrorism to assume arbitrary decree powers wiping out any pretense of a democratic government. The terrorist incidents are arguably related to Hollande’s colonialist embrace of the ‘regime change’ assaults against the secular nationalist governments of Libya and Syria and his policy of sending (or tolerating the recruitment of) marginalized French youth of North African ancestry to fight in the ensuing civil wars. This has further strengthened the rise of the extreme right in France. As the Socialist and Republicans compete for dictatorial powers to serve business’ regressive agenda, the nationalist, protectionist and social reformist policies of the National Front are emerging as the populist alternative in the coming presidential race. Anti-fascist rhetoric has worn thin and important sectors of the working class will turn to the National Front in defense of their jobs and social legislation. The anti-immigration rhetoric of the National Front is now part of the political vocabulary of the Republicans as well as Prime Minister Valls. The only alternative to a power grab by the French hard right is a mass general strike and sustained street battles in order to resist the reaction by decree. As throughout history, popular struggles in France begin in the streets – among the trade unions and young workers angrily facing low wages, austerity and the grim prospect of ‘permanently’ temporary jobs. The outcome of the intensifying French labor-capital conflict will have a decisive impact on the future of labor throughout Europe, especially among all Left unionists. Beyond Europe, the Anglo-American onslaught against labor and the working class resonates most directly in Latin America and to a lesser extent in Asia and Africa. The first country to fall victim to capital’s attack was Mexico with the implementation of the North America Free Trade Agreement (NAFTA). By the early 1990’s NAFTA had demolished the independent Mexican trade unions, crippled social legislation, eliminated subsidies to small corn farmers, forced peasants into debt, reduced minimum wage, doubled poverty levels and turned the majority of the labor force into landless, indebted, casual workers. On the other hand, NAFTA has been a bottomless source of wealth as capitalists accumulate double and triple digit profits and absolute power to hire and fire employees. Mexico’s government, under Anglo-American capital, has allowed the illicit transfer of hundreds of billions of dollars of Mexican assets to US, English and other overseas banks, which have become immense money-laundering operations. The proximity of Mexican drug cartels to the US banks has facilitated the extension of their networks into the US market. The horrific expansion of drug cartel death squads, linked to Mexico’s political leaders, dates from the 1990’s and the signing of NAFTA. This bloody nexus has consolidated neoliberal political power in Mexico and weakened the possibility of a viable mass electoral alternative. Anglo-American dominance in Latin America in the 1990’s led to an entire panoply of regressive policies: privatizing and denationalizing the most lucrative natural and state resources, banks and industries; reducing wages and social spending for labor while increasing the concentration of capital. By 2001 however the Anglo-American edifice collapsed throughout South America with the demise of its neo-liberal political leadership. From Venezuela in 1999, to Argentina in 2002, Brazil 2003, Bolivia 2006 and Ecuador 2007, left and center-left parties capitalized on their mass support and were elected into power. They took advantage of global economic conditions with the rising commodity prices, booming Chinese markets and new regional alliances to fund a variety of progressive social agendas, including increased social expenditures, guaranteed pensions, family allowances, minimum wages, wage increases for public sector and expanded labor rights. The Anglo-American power elite was in retreat and isolated, but it was far from defeated. They retrenched and prepared to re-mobilize their strategic business, banking and political allies when the opportunity arose. They counter-attacked when global and regional conditions turned unfavorable to the social regimes. The assault on Latin America was preceded by the Anglo-American neo-liberal take-over of Northern Europe from the 1990’s to the first decade of the 21st century. This was followed by the sweep and grab of the Balkans and Southern Europe. The combined Anglo-American-EU-NATO offensive now seeks to reverse the last social-welfare regimes in Europe: France and Italy with the help of President Hollande and Prime Minister Renzi. Simultaneously the Anglo-American offensive has been launched throughout Latin America. Their goal is to recover the imperial prerogatives, political power and economic privileges lost during the previous decade. The primary Euro-American target is the ‘golden triangle’, Argentina, Brazil and Venezuela. These countries constitute a global center of immense oil and agro-mineral wealth. The Argentine neo-liberal restoration took off in December 2015 with the election of far-right President Mauricio Macri (image left). 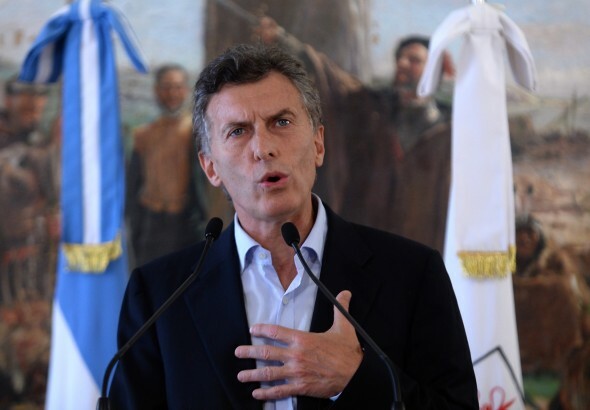 His junta wasted no time in stripping the state of its social legislation, dismantling job security through large-scale layoffs and assuming authoritarian rule by decree to devalue Argentina’s currency by 40% and to eliminate state subsidies and raising the price for gas, electricity, transport, and water between 300 and 800 %. The regressive offensive was in full force. Next, Brazil’s twice elected President Dilma Rousseff was ‘impeached’ and essentially overthrown by a bizarre legislative right-wing coup-d’état, designed to reverse a generation of progressive regulatory, labor and employment legislation. It was also secretly designed to halt corruption investigations against many right-wing politicians. Venezuela is next. It will be the scene of a full-scale-elite coup-d’état with imperial backing, to overthrow the government of President Maduro and end decades of progressive social advances under the Chavista governments. While in France and Italy, the great social reversal is being implemented by internal enemies from the ‘progressive’ political parties (“Trojan Horses”), in Latin America the reversal is led by openly hostile class enemies who depend on the arbitrary exercise of executive power. The drive to put a definitive end to the ‘welfare state’ in Europe and Latin America is marked by the use of dictatorial decrees, (in the style of Mussolini in the 1920’s) as exercised by Argentina’s elected President Marci in January 2016 and Brazil’s ‘Interim (Coup) President’ Temer in April 2016. Meanwhile capitalist lockouts, hoarding and sabotage are being used to crush Venezuela’s elected government. This epochal confrontation has spread across Africa and Asia. China’s capitalist offensive has seen a four-fold increase in the number of new billionaires in less than a decade, at the expense of hundreds of millions of workers stripped of their rights and social programs. South Africa, under the ANC government, turned its back on social gains promised by the liberation struggle and has imposed regressive social legislation and repressive anti-labor decrees. A corrupt class of black and white billionaires now rule by guns and clubs over the black working class. In Africa and the Middle East, the social welfare states of the nationalist regimes in Iraq and Libya have been completely shredded through imperialist military intervention and civil war. Their once advanced societies have been thrown back into ethno-tribal warfare with no remaining modern social institutions in those two blighted, resource-rich nations. Wither the Class Struggle: Historical Reversal and Class Revolt? The Anglo-American offensive to reverse decades of social advance has captured most of Europe. They have incorporated or coopted the Social Democratic parties and are moving swiftly toward dismantling the decade-long center-left welfare states in Latin America. In Africa, the centerpiece of Anglo-Americanization is South Africa, the continent’s most advanced bastion of international capitalism. In Asia, China, the second most important capitalist economy in the world, has been leading the struggle to overturn the social agenda of the revolutionary past. Large-scale, prolonged class resistance in several decisive centers is emerging to confront this Anglo-American process of reversion. The class confrontation however takes specific characteristics in each country. In France, the major protagonists of street fighting and marches are young unemployed or casual workers, members of the strategic transport and oil unions and student-workers facing a bleak future of marginal employment and a shredded social safety net. Trade unions and farmers’ association have joined the street struggles on numerous occasions, possibly in preparation for a general strike. In Latin America, the center of the class struggle is Argentina. Power-mad President Macri immediately imposed regressive policies against all sectors of the working class. His actions managed to unite the four major trade union confederations, multiple retirees associations and small businesspeople bankrupted by exorbitant charges on gas and electrical use and regional neighborhood federations. The widespread growth of job actions among public sector employees points to a general strike. The regressive assault on long-term social legislation in Brazil immediately followed the thinly disguised capitalist coup. The ousting of President Rousseff has provoked street demonstrations, led by the huge rural landless workers movement (MST), the confederation of industrial and service workers (CUT), social movements of the homeless workers and the recipients of Lula’s poverty programs. New revelations, based on taped conversations among the coup plotters reveal their plans to oust the incumbent President Rousseff in order to derail official investigations into their own corruption scandals. This has enraged the general public. With the initial take-over, the Brazilian political-financial elite has prepared to launch its full-scale reversal of pensions and employment laws and wage guarantees. The pro-business leadership plans to slash corporate and wealth taxes and to appoint business executives to all leading ministries. The deep corruption scandal and the mass demonstrations suggest the rightwing power grab may not survive. The regressive offensive in Venezuela has severely crippled the national economy and deeply eroded living standards of the vast majority of the working class. The rightist Congress, backed by the US and allied with international mass media, industry and multinational banks, are trying to force the resignation of Socialist President Maduro. Maduro has declared a state of emergency and mobilized the armed forces. He called on the military and popular militia to defend the constitutional order and has threatened to mobilize the workers to “take control of the means of production”. Still, the leftist government vacillates over arming the militias and workers. A wide gap remains before the word and the deed. In the meantime Venezuela’s right wing and left-wing mass mobilizations face each other in the streets seething with class hatred and waiting to engage in a decisive confrontation. The military thus far remains constitutionalist and on the side of the elected president. In South Africa, the corrupt pro-business ANC led by President Zuma (image right) murdered dozens of striking mine workers. It has impoverished millions of shantytown residents, while increasing the wealth and power of the black-white elite. On April 30, 2016, 1.1.million South African activists, including civil society and community organizations and trade unions covering the mining, manufacturing and service sectors have organized to form a new confederation linked with informal, unemployed and poor workers. The South African Workers Summit replaces the moribund and corrupt labor confederation, COSATU, the ‘labor desk’ for the neo-liberal ANC regime. The new confederation will co-ordinate mass struggles and reclaim social programs as a central part of the anti-capitalist revolution. In China, the growth and consolidation of the world’s second largest concentration of billionaires has led to the proliferation of large-scale industrial workers’ strikes, walkouts and confrontations with factory bosses, company unions and government officials. China is becoming the epicenter of Asia’s working class struggles. Chinese workers have forced the government to investigate and jail over 200,000 corrupt officials, high and low, and to concede substantial wage increases and social compensation to factory workers. Fearing more social upheaval, China’s billionaires and multi-millionaires have transferred hundreds of billions of dollars of stolen assets abroad in a buying spree of high-end property in the ‘safe’ Anglo-American “heartland” of world reaction. The continued advance of working class struggles against the public and private oligarchs has forced the Chinese Prime Minister to reform elite privileges and prosecute large-scale banking swindles and illegal seizure of farmland. Especially important, millions of workers have successfully secured double-digit wage increases and the right to legally live in urban/industrial and construction centers. As it gains momentum, class struggle in China can become the centerpiece for a wider Asian social transformation and a great leap forward to socialist values. The Anglo-American drive to establish a global regressive social order has pushed billions of workers on five continents into destitution, insecurity and lifelong exploitation. The capitalist world rules by fiat and violence, declaring that social regression and worker repression are the ‘wave of the future’. For the elite, the proper order of the universe is being ‘restored’! In response, new working class organizations have emerged and engage directly to defend their historic social advances and economic rights. In the course of defending their past progressive social legacy, the new working class militants can clearly see the imperative to challenge and overthrow the entire political and economic order. From France to Latin America, from China to South Africa, class struggle is defining the present and future of class relations. (SOTT with Audio) ~ Democratically-elected Brazilian president Dilma Rousseff has been suspended pending impeachment, replaced with a corrupt, right-wing, unpopular U.S. spy. Modi’s India seems to be aligning more with the U.S. in confrontation with China. South Africa is suffering at the hands of U.S. intrigue. In short, it appears as if the U.S. Empire is launching a multi-front war on Russia and China by ‘converting’ its BRICS allies to the dark side. This comes as the U.S. ‘policy’ in Syria is coming apart at the seams. Their ‘friend and ally’ Turkey has been exposed as arguably the biggest supporter of ISIS/Daesh in Syria. The U.S. is feebly trying to maintain that the terrorist groups it supports are ‘moderates’. But unwilling to admit defeat, the U.S. seems keen on taking the world down with it in perhaps the biggest case of suicidal hubris the world has ever known. The Empire of Chaos(The US) has won a major victory in Brazil destroying a democracy in order to bring Brazil back under control. Dilma Rousseff has been impeached on trumped up charges ignoring the wishes of the 54 Million Brazilians who voted for her and replacing her with the traitor Michel Temer. Temer gives a whole new meaning to the idea of rule by the 1% because Temer has a 1% approval rating. 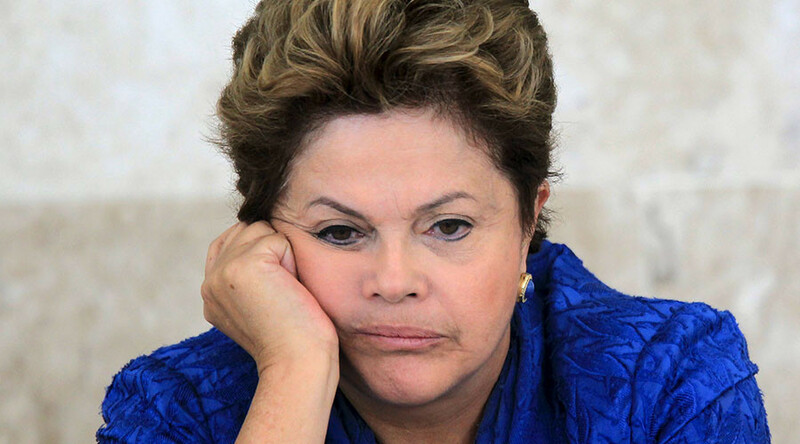 Rousseff has been suspended from office for 180 days while the impeachment process continues. Brazil has joined the list of successful recent coups in Honduras, and Paraguay. Like the people of Argentina the people of Brazil are about to be reminded of what it means to be ruled by neo-liberal Hyenas. For the people of Brazil the battle has only begun. The 1964 coup in Brazil installed a brutal military dictatorship and was only the first of many coups that would leave the entire region under the fascist rule of Operation Condors network of military juntas. The people of Brazil and of all of Latin America are in deadly danger. By this act the US has signaled that even minor reforms like those carried out by Brazil’s workers party are unacceptable. Nothing must be allowed to impede the looting and impoverishment of the planet at the hands of the multi-national corporations. Yet the loss of Brazil has even worse consequences for the globe. It is a major strategic victory in the empire of Chaos attempt to reconquer Latin America. It is also a major victory in the effort to destroy the BRICS countries. It marks a major defeat in the effort to build a multi-polar world. Worse still Soft coups are also making gains in Venezuela and in South Africa. In Venezuela a recall referendum obtained the necessary signatures to remove Nicolas Maduro from office. In South Africa a court ruled that Jacob Zuma must again face hundreds of charges that were dismissed years ago. Both Venezuela and South Africa have been the victims of a covert war campaign. In Venezuela a wave of assassinations continues to murder those loyal to the Bolivarian Revolution. In South Africa a wave of arson attacks have been carried out that the government has blamed on the US embassy (ie the CIA). As if plunging large parts of the globe into unending warfare is not enough the empire of chaos is determined to destroy every independent country on the planet. Before I discuss the latest coup in Brazil I will give a brief description of the 1964 coup in Brazil that would go on to have such disastrous consequences for all of Latin America. My account is based on William Blum’s Invaluable book “Killing Hope” Brazil is Chapter 27 out of 56 each recording coups or covert wars the US has carried out since 1945. Jose Goulart had become president after Janio da Silva Quadros had been forced to resign or face a military coup. Goulart the Vice President barely made it into office Right-Wing military officers tried to bar him but Loyalist military officers had interceded forcing the fascists to back down. Quadros had been quite conservative but had sought to ally Brazil with the nonaligned movement and to trade with the USSR. Goulart was also only a mild reformer but even before the moment he came into office the CIA, the Pentagon, the State department began plotting his downfall. CIA officer Vernon Walters (operating under cover as a military attache ) who would go on to play a vital role in setting up operation Condor was a major player in the coup. He helped organize the coup plotters in the Military. Goulart was first targeted with economic warfare, political destabilization and media war. Globo Media which played a major role in the current anti-Rousseff coup played the same role in the 1964 coup. The CIA financed mass demonstrations, bribed political opposition and helped fund their campaigns. It created it’s own labor movement the AIFLD to destroy the left wing labor movement and to stage strikes and even armed attacks. The tactics of color revolution/Hybrid War are far older then the terms themselves obviously. As mentioned the US had begun plotting against him even before he ever assumed office and in fact had engineered him being fired as minister of Labor back in the 50′s. Once he became president his offenses in the eyes of the empire were refusing to fire ministers the US labeled “Communist. He sought to trade with the eastern block. He instituted mild economic reforms including a very limited land redistribution program. He passed a law limiting the amount of profits multinational corporations could take out of the country and he nationalized a subsidiary of ITT. For this he was accused of seeking to install a “Totalitarian” Dictatorship by the State department. When they had stirred up enough chaos with their economic war and destabilization campaign when they had succeeded in vilifying Goulart in the media they launched the coup. The military who had been indoctrinated by the US in fanatical anti-communism and trained to see their own people as the enemy were given the go ahead for the coup. On March 31st the CIA backed fascist divisions moved to occupy the capital city Rio. However the CIA had only gained control of a faction of the military other loyal divisions were willing to resist. The US sent in a huge Naval detachment including Aircraft carriers and destroyers to signal their backing for the coup. Goulart decided to flee rather then risk a civil war. By April 1st he had fled and the Fascist General Castelo Branco seized power arresting thousands of opponents and shooting protestors. And of course the dirty war came anyways tens of thousands would be tortured and killed over the next decades. Although Latin America’s endless dirty war began long before the Brazil coup (Unending war and oppression began in1492) the 1964 coup would play a decisive role in helping to spread it throughout the continent. Brazil would play a vital role in the coups in Chile, Uruguay, Argentina and in training the death squads and torturers of the continent. 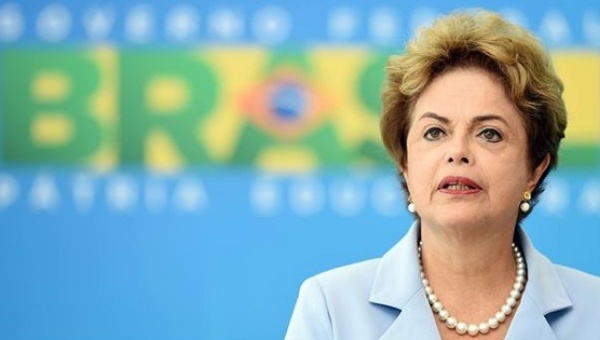 Dilma Rousseff herself was among the hundreds of thousands tortured. Meanwhile members of the Condor Network are still powerful in many Latin American militaries and the CIA and Pentagon influence continues. For more on Operation Condor check out my October 2015 article “Operation Condor”. For the continuing dirty war in Latin America see my March 2016 “War on Latin America.” In light of this history it is clear why we must resist this latest coup which threatens to reignite Brazil’s dirty war. Pepe Escobar has written the definitive account of the coup in Brazil. Thus for a detailed account track down the numerous articles he has written on the subject. Frankly I feel more like screaming or crying than writing about this tragic moment in Brazil’s history. The only real difference between the April 64 coup and the May 2016 coup is that the military were not called in to overthrow the government. Hence people are referring to it as a soft coup. However the manufactured opposition, the media war, the economic war and doubtless the CIA bribes flying left and right are all the same. 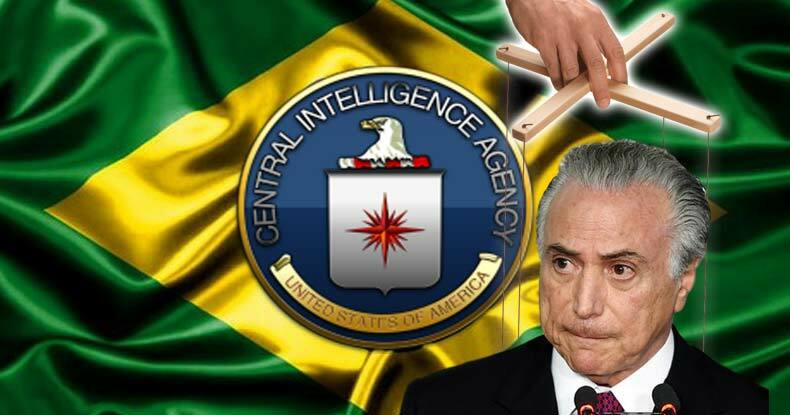 In fact just like Castelo Branco Brazil’s new president Temer is a CIA asset. Brazil’s coup has a lot in common with the recent coups in Honduras and Paraguay. Thus even though Brazil’s coup was accomplished with legalistic means does not mean that the tortures and disappearances may not soon re-appear in Brazil not that they ever really ended given Brazil’s unending “low intensity” drug war and privatized death squads that masquerade as security agencies. These agencies of course were a major factor in the coup part of what Pepe Escobar calls Brazil’s “BBC.” “BBC” stands for in this case not the notorious British propaganda outfit but for the three main economic interests manipulating Brazil’s senate to vote for impeachment. BBC stands for the Bullet, The Bible, and the Cattle. The bullet is weapons and private security. The Bible is pastors and “Evangelical Fanatics.” While Cattle is the powerful Agribusiness lobby. Pepe also lists some illuminating statistics on the senate they are 80% White although Brazil is largely a brown and Black country. 60 percent of the Senate are from political dynasties 58% of them are under criminal investigation and 13% of them were not elected at all worming their way in as “alternates.” These are the oligarchs who had the final say in destroying Brazil’s democracy. They have ignored the wishes of the 54 Million Brazilians who voted for Dilma Rousseff and have replaced her with the traitor Michel Temer with his 1% approval rating. The main front men for this CIA coup were first Judge Sergio Moro who with his completely one sided car wash investigation set the coup in motion. By ignoring the crimes of the right and focusing only on crimes by the left he turned a corruption investigation into a coup. Next there was then house speaker Eduardo Cunha notorious as one of the most corrupt politicians in Brazil with millions in swiss bank accounts. He lead the impeachment drive in Brazil’s lower house fast tracking the impeachment process. However he lost his job as speaker so that the coup would not be a complete laughing stock. After all Dilma Rousseff is not even charged with having been corrupt and is innocent yet her impeachment campaign was lead by the Cunha “the Shark” one of the most corrupt. Lastly there is Michel Temer or Brutus as Escobar calls him. He openly admitted that the impeachment lacked all legitimacy before switching sides in a twisted power grab. These criminals have earned by their actions the hatred not just of Brazil but of Latin America and indeed of everyone who opposes the empire. Of course they were merely the tools of the Brazil’s Oligarchs, the CIA, and Wall Street but by their treachery they have set Brazil back decades. 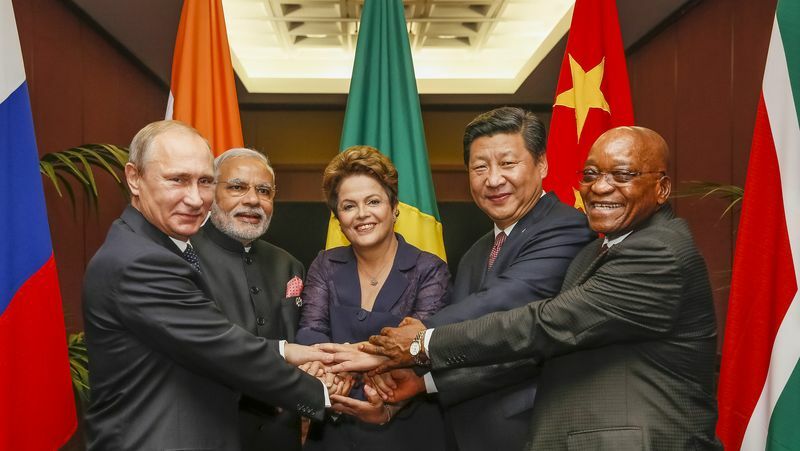 The loss of Brazil will help sabotage BRICS. It will be a major blow to attempts to resist the empire of Chaos throughout the continent in Venezuela, Ecuador, Bolivia, and the other countries that have so far avoided soft coups. For the people of Brazil who had only slowly begun to climb out of poverty thanks to the reforms of Brazil’s workers party which despite it’s flaws did create a major rise in the standard of living the Coup means they will be Ruthlessly thrust back into poverty. Brazil’s massive oil wealth will go not to improving the lives of it’s citizens but to enriching the billionaires on Wall Street. Far worse may await them as the new coup government will eventually begin to wage war on the angry majority of Brazil to insure that they remain in power. The people must begin to prepare themselves for resistance and in my opinion for revolution. Democracy has failed in Brazil mild reforms have failed in Brazil. The people of Brazil must begin to organize to seize back the power. And should they ever prove successful they must make radical changes to their society that will make impossible this sort of “Soft coup”. How long will Latin America’s Oligarchs be allowed to wage their campaigns of mass murder before the people wise up and give them a taste of revolutionary justice? Goulart thought he could spare his country a war if he resigned and was proven tragically wrong. Recent experience in Honduras or Ukraine do not give us much reason to believe that things will go differently for Brazil. However there are two factors that give reason for hope that this coup may be reversed. First Brazil has powerful social movements, the landless workers movement, the landless peasants, and many thousands of smaller groups. Second if Lula can survive the attempts to destroy him as part of the Car Wash Scandal he may run again in 2018 seizing Brazil back for the people. I hope his security is on full alert sadly his potential to run again and restore democracy in Brazil means his life is in great danger. If only the idea of Lula being assassinated either violently or via cancer or heart attack were paranoid as some of you are doubtless thinking. But ask Fidel Castro who has survived dozens of assassination attempts. One can no longer ask the great Hugo Chavez but the details of his murder continue to emerge thanks to the work of journalist Eva Golinger. She has uncovered even more evidence of his assassination in particular in a recent interview she discussed some of the many attempts to kill him which failed. One included a Colombian death Squad camped out at a Venezuelan Oligarchs place thankfully they were arrested in time. Another involved a sniper caught staking out someplace Chavez was about to speak at. Undoubtedly the most memorable involved the attempt to assassinate him with a radioactive chair at an “Prestigious” University in New York where Chavez was giving a speech. She also revealed the names of several traitors who defected to the united states shortly after his death. One of these traitors former Major General Herbert Garcia Plaza is now coordinating the destabilization of Venezuela from the safety of the US. I highly recommend you read the interview with her yourselves to learn even more shocking information. Unfortunately I must turn my attention to the ongoing “soft coup” in Venezuela. There was some good news the opposition plot to privatize Venezuela’s public housing was struck down by Venezuela’s supreme court as unconstitutional since it interfered with Venezuela’s constitutional commitment to provide housing education healthcare and other social programs. Chavez’s radical reforms have born fruit and Venezuela’s Supreme Court is firmly committed to defending Bolivarian Socialism. However the opposition appropriately named MUD continues it’s campaign to destroy Venezuela on the orders of their CIA/NED controllers. They launched a recall petition and easily achieved the 1% of signatures needed. Next they only need 20% of voters to agree to a recall referendum and then a Referendum forcing Maduro to resign can eventually be voted on. Maduro is determined to resist this scheme and hopes to fulfill his term which doesn’t end until 2018. Obviously this is a dangerous new development. In addition a wave of assassinations continue to murder loyal government officials and Bolivarian politicians. The CIA is waging a dirty war on Venezuela using drug dealing Colombian death squads and right wing Venezuelan terrorists to wage an operation condor style Phase III assassination campaign aimed at weakening the government by killing it’s most promising leaders. However even more destabilizing has been the economic war and Venezuela’s Oligarchs continue to sabotage the economy eroding public support for the Bolivarian Revolution. The Venezuelan Revolution a source of hope and an inspiration for the entire world remains under deadly threat. In South Africa a soft coup threatens another BRICS member. South Africa is another victim of the economic war which has sent commodities prices plummeting. This has served to destabilize South Africa just as it has Venezuela, and Brazil. But of course the US isn’t content with destabilizing South Africa it wants to overthrow the ANC who have ruled South Africa since the fall or Apartheid. The ANC is far from perfect in a secret deal before coming to power they had to renounce their longstanding platform of nationalizing South Africa’s resources and building a socialist society. However given it was 1994 and the Soviet Union had just collapsed the constant criticism they have suffered since from the left while valid is slightly unfair. Andre Vltchek points out that the ANC has made far more progress then people have given them credit for. They have also been plagued by corruption scandals but only a fool would believe that if the ANC are overthrown in a soft coup that corruption will suddenly disappear. Instead whoever replaces them would open the country to be looted by western corporations reversing whatever gains people have made since the fall of apartheid. You don’t fight corruption with coups because coups are by their nature corrupting they involve people accepting bribes from the CIA and other intelligence agencies to betray their country. Obviously those willing to sell out their country are unlikely to resist bribes for lesser crimes. Just ask the Ukrainians. The destabilization campaign against Zuma began innocently enough with students demanding lower fees. However soon instead of chanting the “Fees must Fall” they were shouting “Zuma must Fall.” Now EFF head Julius Melema is calling for Zuma’s downfall even threatening to use force. And if that wasn’t bad enough the US embassy (CIA) have been caught organizing opposition movements and even hiring organized crime to burn down 19 schools in the Limpopo province. 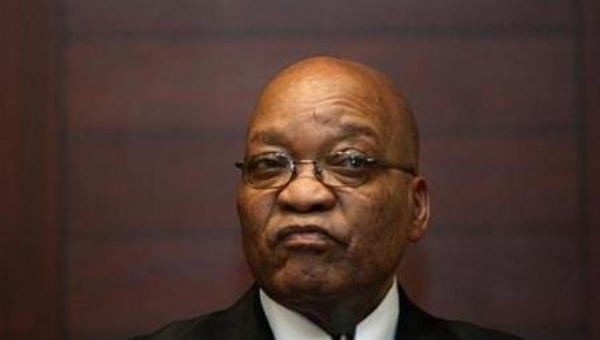 Worse now the supreme court has ruled that Zuma must face 783 charges against him that were dismissed back in 2007. They date from when Zuma was deputy president under Thabo Mbeki. Zuma was dismissed as deputy president but this lead to a power struggle within the ANC in which he emerged victorious. He was later elected president despite this scandal so it is ridiculous to try to overthrow him based on a 10 year old scandal. Zuma like Maduro, and Rousseff is facing a soft coup attempt. Whatever petty crimes Zuma may have committed whatever the flaws of the ANC we must oppose this soft coup attempt. The goal has nothing to do with reducing corruption in South Africa or reducing inequality as the EFF deceptively claim. Anyone who thinks a CIA coup will reduce inequality in South Africa needs to read Blum’s “Killing Hope” since every CIA coup has been undertaken to preserve or worsen inequality. 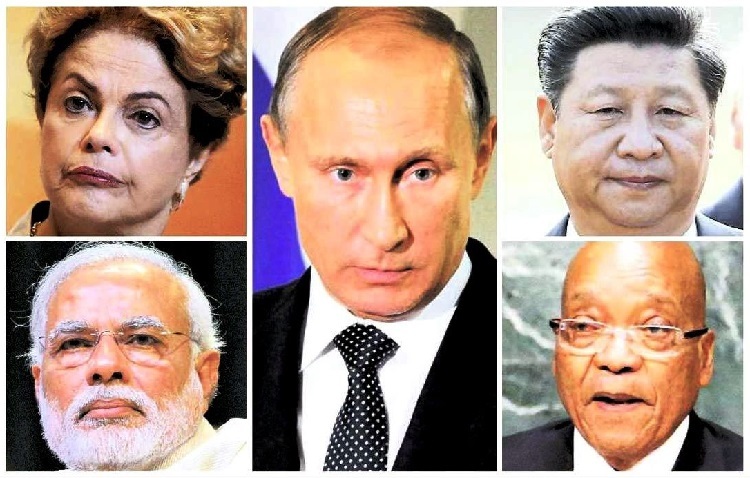 Instead the goal is clearly to destroy the BRICS the main hope for a multipolar world. The goal is to break up the economic partnership between China and South Africa damaging China the economic engine of the multipolar world and further isolating Russia the military backbone of BRICS. We must oppose the coups in Brazil, Venezuela and South Africa. We must support the people as they resist the return of fascism in South America. We must support South Africa as it struggles to maintain it’s independence. The Empire of Chaos thinks it can preserve itself by destroying all the alternatives. It is far to late for that Capitalism itself is in crisis and people are already dreaming of a better world. Remember the overthrow of Arbenz in Guatemala in 1954 inspired the revolutionary career of Che Guevara. In fact to carry out their economic war on the BRICS the Oligarchs are putting the whole stability of their global capitalist system at risk a dangerous gamble. Although 2016 has been a year of victory for the forces of counter-revolution beneath the surface all over the world people can sense revolution in the air. Thus even in the face of defeat and danger instead of despairing we must only redouble our efforts. The time of revolutions is approaching. (Pepe Escobar, RT) ~ Never in modern political history has it been so easy to “abolish the people” and simply erase 54 million votes cast in a free and fair presidential election. This is the culmination of a drawn-out process that started even before Rousseff won re-election in late 2014 with over 54 million votes. I have described the bunch of perpetrators of what Brazilian creativity has termed‘golpeachment’ (a mix of coup – “golpe” in Portuguese – and impeachment) as Hybrid War hyenas. When golpeachment reached the lower house of Congress – an appalling spectacle – Rousseff was eviscerated by Hybrid War hyenas of the BBC variety; “BBC,” in English, stands for“bullet,”“bible” and “cattle,” where“bullet” refers to the weapons and private security industry,“bible” to pastors and evangelical fanatics, and “cattle” to the powerful agribusiness lobby. The golpeachment gang gets really incensed when they are identified as coup plotters. Still, they could not give a damn about the OAS, Mercosur, Unasur – all of them condemned the coup – not to mention the Holy Grail: the BRICS. Under Brutus 1, the Foreign Ministry, to be led by a sore loser senator, is bound to sink Brazil’s key role in BRICS cooperation, to the benefit of Exceptionalistan.All one needs to know is that neither Nobel Peace Prize-winner Barack “kill list” Obama nor Queen of Chaos Hillary “We came, we saw, he died” Clinton condemned the ongoing regime change light/golpeachment. That’s predictable, considering Exceptionalistan’sNSA spied on Petrobras and Dilma Rousseff personally – the genesis of what would develop as the Car Wash investigation. (Pepe Escobar, RT) ~ The gloomy and repulsive night when the female president of the 7th largest economy in the world was the prey of choice fed to a lynch mob of hyenas in a drab, provincial Circus Maximus will forever live in infamy. By 367 votes for and 137 against, the impeachment/coup/regime change-light drive against Dilma Rousseff cleared the Brazilian Congressional circus and will now go to the Senate, where a“special commission” will be set up. If approved, Rousseff will then be sidelined for 180 days and a low-rent tropical Brutus, Vice-President Michel Temer, will ascend to power until the Senate’s final verdict. This lowly farce should serve as a wake-up call not only to the BRICS but to the whole Global South. Who needs NATO, R2P (“responsibility to protect”) or“moderate rebels” when you can get your regime change just by tweaking a nation’s political/judicial system? The Brazilian Supreme Court has not analyzed the merit of the matter – at least not yet. There’s no solid evidence anywhere Rousseff committed a“crime of responsibility”; she did what every American President since Reagan has done – not to mention leaders all across the world: along with her vice-president, the lowly Brutus, Rousseff got slightly creative with the federal budget’s numbers. Still, without a popular vote, the massively rejected tropical Brutus twins, Temer and Cunha, will find it impossible to govern, even though they would perfectly incarnate the project of the immensely arrogant and ignorant Brazilian elites; a neoliberal triumph, with Brazilian “democracy”trampled down six feet under. It’s impossible to understand what happened at the Circus Maximus this Sunday without knowing there’s a gaggle of Brazilian political parties that are seriously threatened by the non-stop overspill of the Car Wash corruption investigation. To ensure their survival, Car Wash must be“suspended”; and it will, under the bogus “national unity” proposed by lowly Brutus Temer. 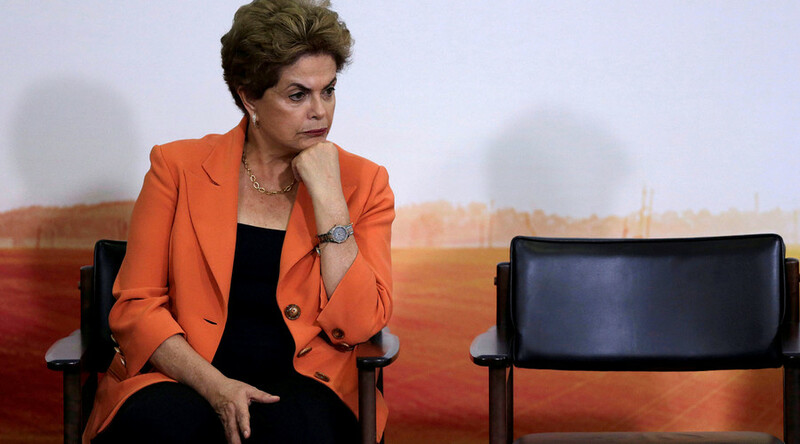 The 54 million-plus who voted for Rousseff’s reelection in 2014 voted wrong. The overall “project” is a government without vote and without people; a Brazilian-style parliamentary system, without bothering with pesky “elections”and crucially, including very “generous” campaign financing flexibility not bound to incriminate powerful companies/corporations. In a nutshell, the ultimate aim is to perfectly “align” the Brazilian Executive, Legislative, Judiciary and corporate media interests. Democracy is for suckers. Brazilian elites remote controlling the hyenas know very well that if Lula runs again in 2018, he will win. And Lula has already warned; he won’t buy any“national unity” crap; he’ll be back in the streets fighting whatever illegitimate government pops up. As it stands, Rousseff runs the risk of becoming the first major casualty of theNSA-originated, two-year-long Car Wash investigation. The President, admittedly an incompetent economic manager and lacking the right stuff of a master politician, believed that Car Wash – which practically prevented her from governing – would not reach her because she is personally honest. Yet Car Wash’s not so hidden agenda was always regime change. Who cares if in the process the nation is left on the verge of being controlled exactly by many of those indicted by the anti-corruption drive? 5. If the coup is allowed to succeed, the opposition will put into play all the elitist and authoritarian proposals that Aecio planned to implement if he had won the election. The post –coup president will surely change labor laws to the detriment of wage workers ; he will annul the policy that supports the adjustment of minimum wage to cost of living; he will implement an unbridled privatization of the work force; he will hand over all Brazilian oil reserves in the off-shore fields to transnational corporations(link is external) (as advocated by Senator José Serra); he will privatize Bank of Brasil and Caixa Economica Federal; he will eliminate free public higher education and introduce tuition-based education in federal universities, as a first step towards privatization; he will repress social movements and freedom of expression on the Internet; he will expel the Cuban doctors who work in the program “More Doctors;” he will give the green light for agribusiness corporations to acquire indigenous land; he will eliminate the independent foreign policy, thus reducing Brazil to being a servant of the United States. It is all of this that is at stake, much more than President Dilma’s current administration or Lula’s political future, at stake in the battle against impeachment. 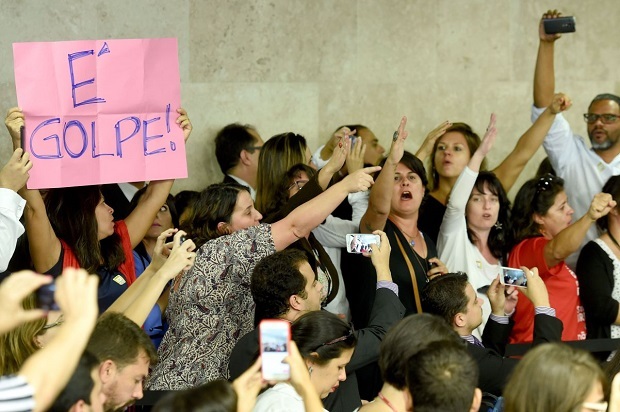 (MST) ~ The Landless Workers Movement (MST) publicly expresses its disgust and dissatisfaction regarding the decision of the Senate, this Thursday (May 12), in admitting the process of impeachment against President Dilma Roussef and temporarily removing her from the post. We are sure, as stated in the text of the case, that the President did not commit any crime with fiscal peddling. If this is to be considered a crime, the vice president, Michel Temer, who now assumes the Presidency, and Senator Anastasia, the rapporteur of the process and former governor of Minas Gerais, should also be accused. (RT) ~ Brazil’s new interim president, Michel Temer, was an embassy informant for US intelligence, WikiLeaks has revealed. “Whoever wins the presidential election will have to come to us to do anything,” Temer reportedly said. (RT) ~ A British military weapons and hardware dealer trading plane parts and troop carriers says his business would take a hit if the United Kingdom votes to leave the EU. Richard Moore operates a specialist firm in Cambridgeshire trading with Eastern and Central Europe and exporting to other Western European states. He told the Mirror that losing access to EU agreements would be a “disaster” for his trade. EU rules allow him to transport arms and military vehicles across borders in member states without having to notify them, he says. If the UK leaves the bloc, he will have to close down his business or move it to another country in Europe. Before the rules were introduced in 2011, Moore would have to contact each state he planned to transport hardware through, and obtain permission, he says. Moore says the firm purchases military hardware such as Magnetrons used to guide fighters on Russian airbases, radar locating equipment, BUK radar systems and scud launchers. “It can be a dangerous trade dealing with not-so-pleasant people, and when things go wrong you can get locked up in prison,” he told the Wisbech Standard. Moore suggests the extra paperwork of operating outside the EU would cause headaches for the Ministry of Defence (MoD). “This could affect our MoD, if they wanted, as they have, special items that are being used against our military. Moore says the EU helps maintain stability and stops wars. “The voices of Palestinian Christians have been drowned out in the turmoil of events; the Western narrative about the ‘Promised Land’ dominates theological discourses in Palestine/Israel and justifies injustices towards Palestinians. As active, responsible, and believing Christians, it is time to review Christian theology and promote a true, Christian way of resisting injustice and work for a just peace – in the Middle East and in the world.We wish you a successful week, full of hope and faith and led by the most essential Christian value of Love. Our prayers are with you during this important event.” (Click here to read the full letter). In an attempt to highlight the plight of Palestinian Christians living under Israeli Apartheid, this year, the official movie which will screened in various South African cities and towns as part of #IsraeliApartheidWeek is “The Stones Cry Out”. The movie documents the plight of the Palestinian Christian community (click here for a trailer, or email southafrica.iaw@gmail.com for a free copy). In the past various South African Church leaders have lent their support to the #IsraeliApartheidWeek (click here). #IsraeliApartheidWeek (IAW) is an annual international series of events (including rallies, lectures, cultural performances, music shows, films and workshops) that raises awareness of Israel’s apartheid policies, violations of international law and human rights abuses toward the indigenous Palestinian people. It is endorsed in South Africa by over 85 organizations including our ruling party, the ANC, and takes place in over 250 cities across the world. Members of the media are invited to an interfaith press conference today (Sunday, 6 March 2016) at Freedom Park Museum (Corner Koch & 7th Avenue, Pretoria starting at 11am). The press conference will launch the South African leg of the annual international #IsraeliApartheidWeek awareness-raising campaign taking place in SA between 7 and 13 March. Speakers at the press conference will include representatives and leaders from the Hindu, Jewish, Tamil, Christian, Muslim and other communities. The British government has found itself at the centre of a battle between Israel and Palestinian campaigners, after saying it would punish local councils who boycott Israeli goods. The Cabinet Office will release guidance on Wednesday saying that locally imposed boycotts, including those targeting Israel, breach WTO rules on procurement. The move, which could benefit Israeli suppliers and other companies with operations in Israel, comes as the Israeli government seeks to fight back against the international Boycott, Divestment and Sanctions movement. Israel’s political elite has been alarmed by the BDS movement’s recent gains among church groups, students and investors. Companies including security contractor G4S, machinery manufacturer JCB and SodaStream, maker of devices to create homemade carbonated drinks, have all been targeted by campaigners. Palestinian groups reacted angrily to the Cabinet Office proposals. “This is a bullet at the very heart of a peaceful resolution to the conflict in the Middle East and the very heart of democracy in Britain,” Husam Zomlot, a senior Palestinian official, told the Financial Times. 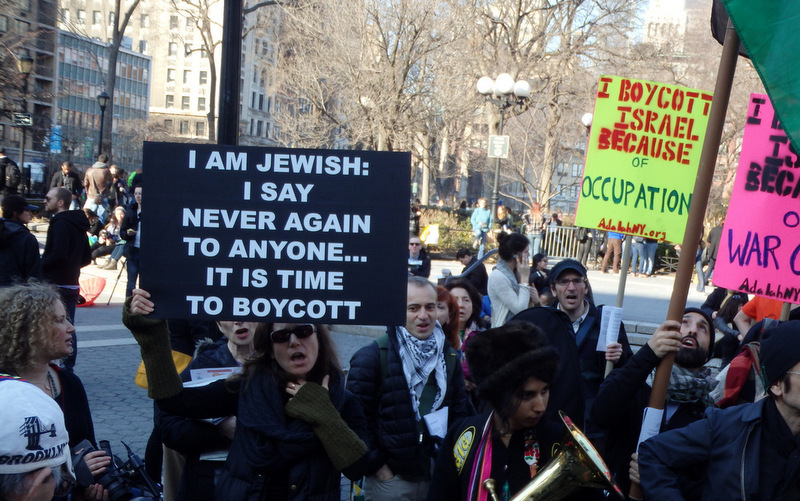 The BDS campaign, which models itself on the fight against apartheid in South Africa, has urged companies and public institutions to boycott Israel until it ends its occupation of Palestinian lands. A spokesperson for the campaign’s Palestine National Committee said the UK government was “making a grave mistake similar to Margaret Thatcher’s unwavering support of apartheid South Africa”. The Cabinet Office plan “comes at a time when the BDS movement is having unprecedented success”, he added. Since 2014 Benjamin Netanyahu, Israeli prime minister, has fought against the boycott movement, which is accused of antisemitism and the broader goals of undermining and delegitimising the Jewish state. The new BDS guidance coincides with a trip by Cabinet Office minister Matthew Hancock to Israel and the Palestinian territories. It will affect all contracting authorities, including local councils and NHS bodies, on the basis that local boycotts breach the WTO Government Procurement Agreement, which demands that all suppliers are treated equally. The Cabinet Office did not provide figures on the number of councils that have adopted boycotts, or the sum of contracts affected. A spokesperson said it had no evidence of proceedings having been launched with the WTO on account of existing boycotts. 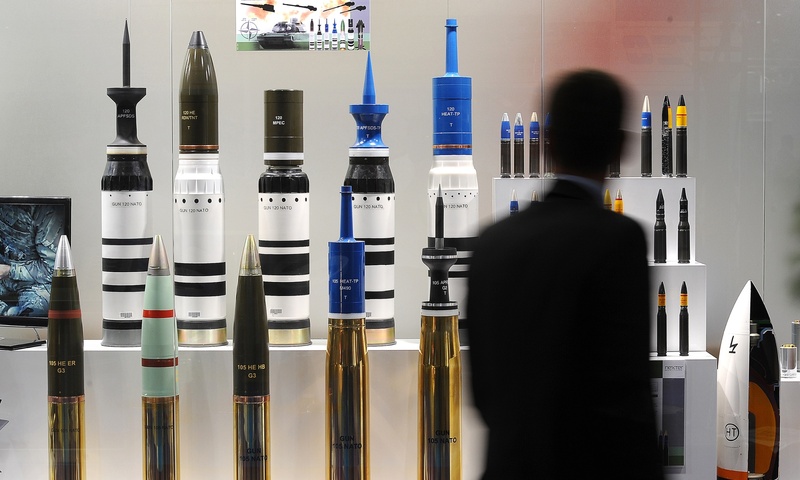 In October, the government proposed rules aimed at stopping pension funds from “politically motivated boycott and divestment campaigns against UK defence companies and against Israel”. The Local Government Association has hinted at its unease at the October proposals and the latest guidance, saying that councils “will always seek to promote democratic values”, and this would sometimes include “taking ethical considerations . . . into account where due process allows”. The guidance would leave private institutions and national and international governments as the focus for the BDS movement. In November the European Commission mandated that goods from illegal Israeli settlements should be labelled, in what the BDS campaign said was “a welcome sign”. The Israeli response to BDS has included legal warfare or “lawfare” against the movement in foreign countries. “We have stepped up our efforts directly and indirectly, dealing with friends of Israel in a variety of countries in which we have the BDS movement, fighting it with legal instruments,” Emmanuel Nahshon, an Israeli foreign ministry spokesman, told the Financial Times. 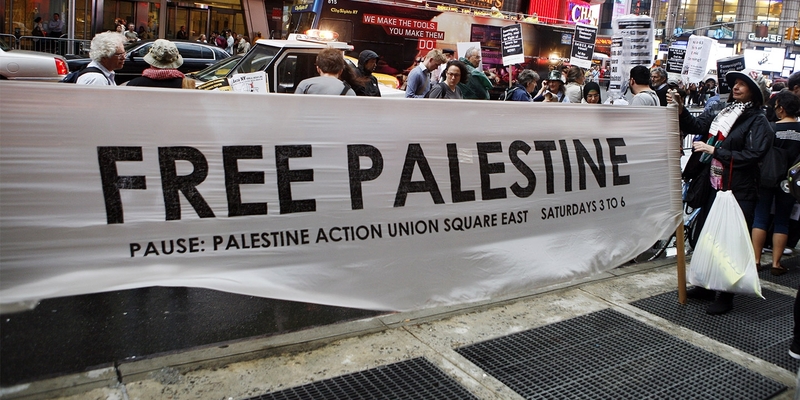 In the US, legislatures in about 30 states, led by South Carolina and Illinois, have adopted or discussed laws or statements meant to counter BDS, according to Omar Barghouti, a Palestinian BDS activist based in Ramallah. Barack Obama, US president, is expected to sign into a law soon a trade bill that includes anti-BDS measures, although the White House has voiced objections to language in it that equates Israel’s internationally recognised territory with its illegal settlements on occupied Palestinian lands. Palestinians say Britain holds special responsibility for finding a peaceful resolution to their decades-old conflict with Israel because it was the colonial ruler of Palestine in the run-up to the creation of the Jewish state in 1948. The new guidance “puts the UK in the position of defending Israel’s expansion and colonialism rather than defending its own rules and laws”, Mr Zomlot said. The UK is cracking down on local authorities who take part in the movement to boycott, divest from and sanction Israel (BDS), saying that it violates global trade laws. This follows an international lobbying effort by the Israeli government to encourage foreign powers to rein in anti-Israel campaigners. It is the second success for the Israel lobby against BDS campaigners this week, after US president Barack Obama signed a law that included language recognising trade between illegal Israeli settlements and the United States. The BDS movement has been dubbed by Israel an existential threat to the state, and is even considered by some politicians as a “new intifada”. The economic impact, however, is disputed. One Israeli government report warned that BDS would cost the state $1.4 billion (Dh5.1bn) each year, roughly 0.5 per cent of the country’s GDP. Other analysts believe that the economic effect is smaller. Few Israeli firms will, for example, mourn the decision by Leicester City Council to stop buying products from Israel, they point out. Instead, the argument has more symbolic motives on both sides. Israel wishes to delegitimise the BDS movement, and therefore protect its control over the narrative of the conflict with the Palestinians. For Israel, the conflict is about what it says is an issue over security and not about rights. For BDS campaigners, the issue is a moral one, with the focus on the deprivation of Palestinians rights and the nature of the occupation. The Israeli-Palestinian conflict is based on narratives. It is nearly impossible for BDS campaigners to significantly derail Israel’s economy, but the conversation that they raise by targetting the likes of Leicester City Council alters the complexion of the mainstream debate about Israel’s behaviour. Therefore, the conflict is fought in small increments that, taken as a whole, may ultimately turn the tide. The 40-year battle to boycott apartheid South Africa is a good example of how long these campaigns can take. 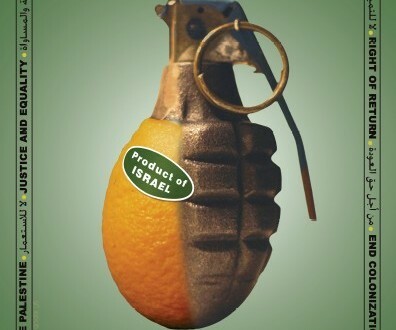 THE U.K. GOVERNMENT today announced that it is now illegal for “local [city] councils, public bodies, and even some university student unions … to refuse to buy goods and services from companies involved in the arms trade, fossil fuels, tobacco products, or Israeli settlements in the occupied West Bank.” Thus, any entities that support or participate in the global boycott of Israeli settlements will face “severe penalties” under the criminal law.